Jusepe de Ribera, the Spanish painter, also known as José de Ribera was born in Játiba near Valencia in 1591. After visiting Parma, Padua and Rome, he settled down in Naples in 1616, which in those days was under the control of Spain. It was here that he spent most of his career. His developed style of painting owed a lot to the influence of the Italian artist of the day, Caravaggio. Ribera became a painter to the Spanish Viceroy who was later succeeded by the Duke of Monterey, a person who secured many commissions for him from the Augustine Monastery in Salamanca. Ribera remained in Naples where he died in 1652. 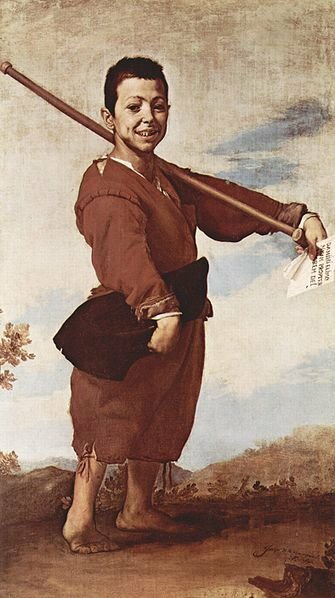 His painting Boy with a Club Foot, which can be found in the Louvre, Paris, is today’s featured work of Art and was completed in 1642 and highlights his more mature style both through its composition and also because of the subject. It is believed a Flemish art dealer had commissioned this painting as the theme of beggars in paintings such as The Beggars by Bruegel the Elder and Murillo’s The Young Beggars had become very popular. The painting, which is typical of his more mature style, shows a disabled Neapolitan beggar, probably a dwarf (originally the painting was entitled The Dwarf) with a club foot, clutching a piece of paper with the words “ Da mihi elimosinam propter amorem dei” which translates to “For the love of God give me alms”. The reason for this piece of paper to be held by the young beggar could be that it was his licence to allow him to beg, which was mandatory in Naples in those days. It also could be, as some have interpreted, that he, the boy, suffered from speech problems and was unable to voice his request for help. It is interesting to see how Ribera has portrayed the beggar, not as a grovelling child, looking downcast and miserable in some dark and grubby alleyway. Here before us is not a down-trodden child but a youngster, standing upright, with a cheeky smiling face and a look of defiant pride as he almost gaily carries his crutch over his shoulder, set against a light and tranquil background. The boy is shown close up and we are looking at him from a low viewpoint which gives the subject a sort of monumentality and self-esteem which would normally have been afforded to a noble person. A novella written in 1801 by the French writer Francois-René de Chateaubriand entitled Atala tells of the tragic love story of Chactas, a Natchez Indian and Atala the half-caste Christian daughter of Simagan, the chief of the Muscogees, an enemy Indian tribe, who had captured and sentenced Chactas to death. Atala eventually frees him from captivity and they run away together. They are helped by Père Aubry, a Christian missionary and hermit, who takes them to his cave and gives them refuge. Atala falls in love with Chactas, but cannot marry him as she has taken a vow of chastity. In despair she takes poison. Père Aubry assumes that she is merely ill, but in the presence of Chactas she reveals what she has done, and Chactas is filled with anger until the missionary tells them that in fact Christianity permits the renunciation of vows. They tend her, but she dies. 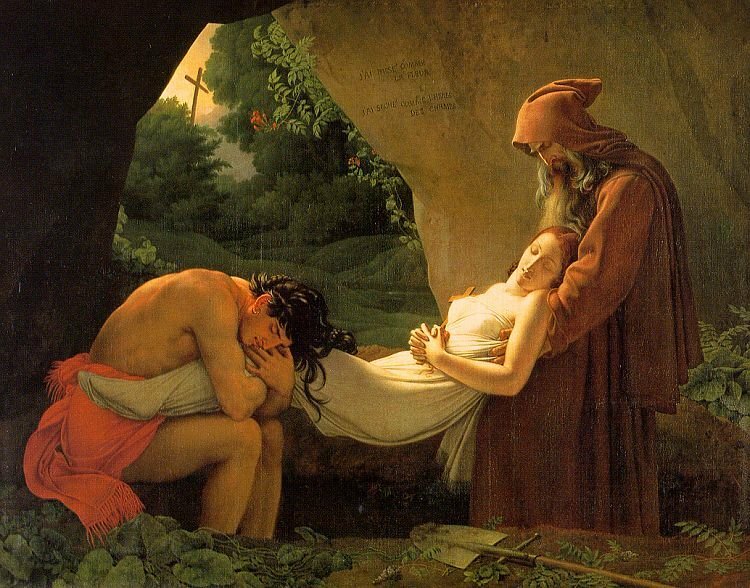 My Daily Art Display for today is the painting completed in 1808 entitled The Burial of Atala by the French artist Anne-Louis Girodet who was inspired by the poignant story of the would-be lovers Chactas and Atala. The death scene, set inside the mouth of the cave, is a representation of the traditional paintings of the “burial of Christ” but in this instance the emotions of passion, love and death are all entwined. The monumental arrangement of the three figures, the setting of the grotto and the solitary cross seen in the background against the sky reminds one of his earlier painting The Dead Christ Supported by the Virgin. Girodet, usually known as Girodet-Trioson, a name he took in honour of a surgeon Dr Trioson, who adopted him after he was orphaned, was born in Paris in 1767. He started school and studied architecture and military studies before concentrating on art. He became a pupil of Jaques-Louis David one of the greatest Neoclassical painters. Girodet was looked upon as a star pupil winning a number of prestigious prizes for his works of art. As was the case in today’s painting, Girodet often preferred literary themes for his paintings. He also gained a reputation as a first class portraitist and many of his works revolved around the power and glory of Napoleon. When he was 48 his adopted father, Dr Trioson died leaving him a sizeable inheritance. From then until his death in 1824 Girodet had no need to earn money by selling his paintings and instead concentrated on his other love, the writing of poetry. The painting featured in My Daily Art Display can be found in Edinburgh at the National Gallery of Scotland. It is entitled The Marne at Chennevières and is an oil on canvas painting completed in 1864 by Camille Pissarro. Pissarro, a French Impressionist painter, was born Jacob Abraham Camille Pissarro in 1830 in the small port town of Charlotte Amalie on the Carribean Island of St Thomas in the Danish West Indies. His father, Abraham Gabriel Pissarro, of French-Sephardic Jewish descent and his mother Rachel Manzano-Pomié, a Creole from the Dominican Republic ran a flourishing general store in the Danish West Indies. At the age of 12, Pissarro was sent to a French boarding school in Paris where he started to become interested in art. He remained there until 1847 when he returned to the Caribbean to help his parents with the running of the shop. He soon became bored with this humdrum life and wanted to concentrate on his true love, art. However his parents did not support his ambition. Whilst sketching locally at the busy port he met Fritz Melbye a Danish painter who had come to the island from Copenhagen in the hopes of becoming a marine artist. It was he who inspired Pissarro to develop into a full time professional painter and Melbye became not only a close friend to Pissarro but his art teacher. Pissarro, having no support for his desire to become a full time artist, ran away to Venezuela with Melbye in 1852 where they lived for three years. In 1855, after his parents pledged to support his artistic ambitions, he returned home and later went to Paris to continue his artistic studies in the likes of École des Beaux-Arts and Académie Suisse and studied under Corot and Courbet. During the Franco-Prussian war of 1870 and 1871 Pissarro had to flee to London from his home in Louveciennes, a western suburb of Paris. Sadly, a number of his paintings were destroyed by the invading Pruissian soldiers. He remained in London until 1890 but returned to visit the English capital on a number of occasions and painted many local scenes. Pissarro died in Paris in 1913 aged 73 and his grave can be found in the Père Lachaise Cemetery in Paris. 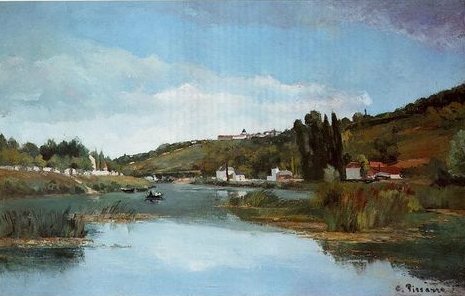 Strong blues, greens and whites dominate this painting of the River Marne and its banks as it meanders passed the town of Chennevières. Chennevières’ church and houses are just visible at the top of the right bank. Paintings by Daubigny and Corot inspired Pissarro’s carefully structured composition and Courbet’s work influenced his extensive use of a palette knife. The small factory buildings and ferry boat add a contemporary note. The painting was exhibited at the Paris Salon in 1865. The last art gallery I visited when I was in Vienna earlier this month was the Albertina. They were advertising two main exhibitions, one of Michaelangelo sketches and one of works by Picasso. I made this gallery my last port of call and in a way I was pleased with that decision. I liked the Michaelangelo sketches but, sad to say, I am not a lover of Picasso’s works of art. As an art lover, I know that is a terrible thing to admit to, but one knows what one likes and vice versa. Why should I pretend that I love his work when in fact I can find little to like about it. So why am I making it one of My Daily Art Display offerings? 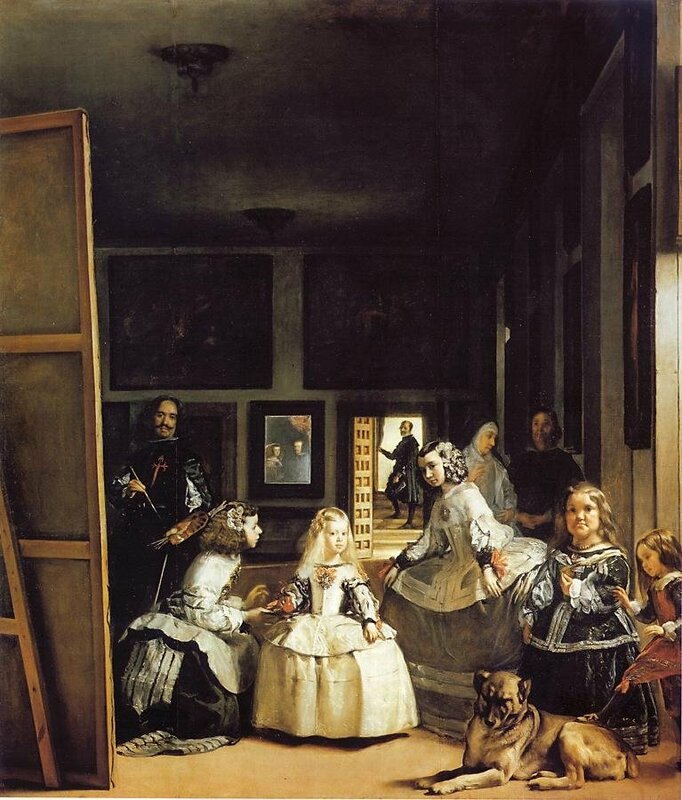 The reason is that yesterday I offered you Las Meninas by Velazquez and today I am offering you one of Picasso’s many interpretation of that work of art which I saw at the Albertina and I will let you judge which version pleases you the most. Pablo Picasso was fourteen years of age when he first saw Velazquez’s painting of the two Maids of Honour and the Indfanta entitled Las Meninas and this was just a few months after his seven-year old blonde-haired sister had died from diphtheria. Two years later, at the age of sixteen, Picasso produced his first sketch relating to the Las Meninas characters. In all, from the time of his adolescence, Picasso, who adored the Velazquez painting, devoted much time to analysing and interpreting this work of art. Today’s painting for My Daily Art Display is Las Meninas after Velazquez by Pablo Picasso and was completed in 1957. It is one of his fifty eight interpretations of Velazquez’s original painting of the same name. 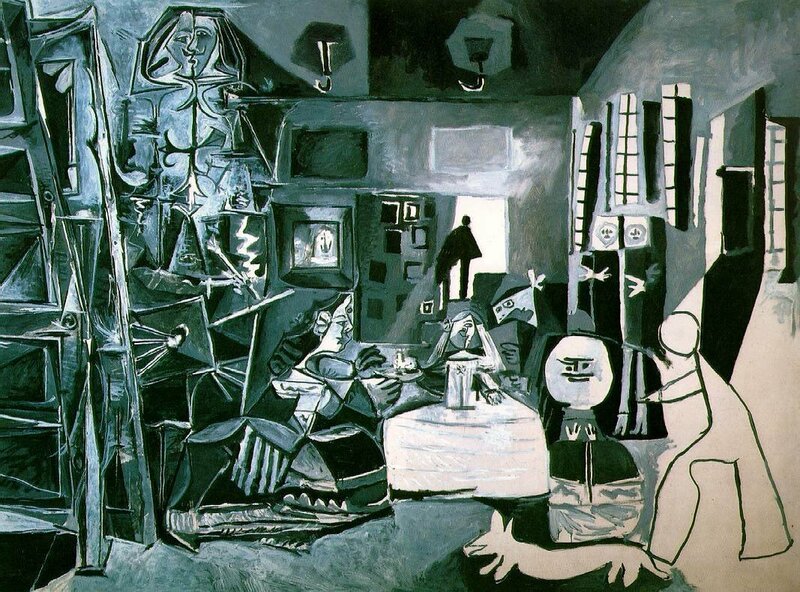 The main characters in Picasso’s work remain the same as in the original Velazquez painting, namely, Velázquez; Doña Agustina de Sarmiento and Doña Isabel de Velasco the two maids of honour (las Meninas) , Doña Margarita, the Infanta; the two dwarves, Maribárbola and Nicolasito Pertusato, and he even reproduces the shape of the dog lying on the floor. In the background, he also keeps the looking-glass, in which one can see two images which represent the king and queen of Spain. So it is up to you to look at today’s and yesterday’s versions of Las Meninas and decide for yourself which you prefer. My Daily Art Display painting of the day is Las Meninas (the Maids of Honour), an oil on canvas work by Diego Rodriquez de Silva y Velázquez. He completed this painting in 1656 just four years before his death at the age of sixty one. It is often referred to as “a painting about a painting”. There is a saying that “Art follows Money”. By that, one means that the very rich can afford to buy the very best paintings and whereas once the major works of art headed to the USA they are now more likely to end up in the Middle East or Asia, which are now areas of wealth. In earlier times, the wealthy classes would become benefactors to the great artists. The rich bankers and merchants could order paintings of subjects of their choice. The church and the papacy had the wealth and power and much of the art was for them or commissioned by them and the subject of the art was of their choice. During those days religious paintings were to the fore as there were so many rich and powerful religious benefactors. 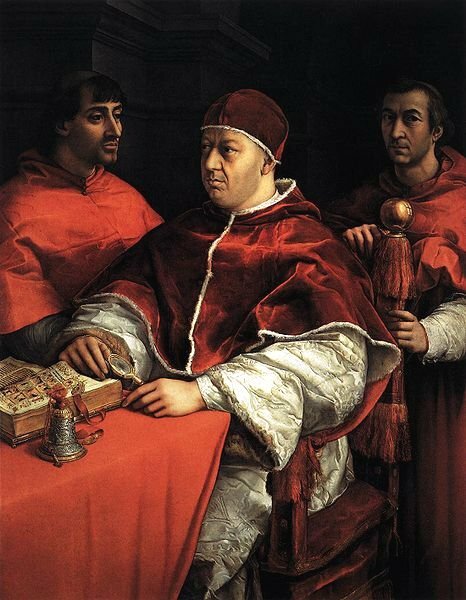 My Daily Art Display today is Portrait of Pope Leo X with two Cardinals. The artist was Raphael Sanzio da Urbino, better known simply as Raphael, and the painting can be found in the Uffizi Gallery in Florence. The painting, completed around 1518, was believed to have been commissioned by Raphael’s great patron, Pope Leo X himself. A great deal has been written about the symbolic meaning of this painting and many art historians have written profusely regarding how one should interpret the picture, often disagreeing with each other so let me just outline the fundamentals of this exquisite work of art. In the picture seated at the table is Giovanni de’ Medici who was elected pope in 1513 and took the name Leo X. The man standing behind the pope with his hand resting on the pope’s chair is the cardinal Luigi de’ Rossi. He was Leo’s first cousin, slightly older, and a particular favourite of the pontiff. The cardinal to the left of the picture is Giulio de’ Medici, the future Pope Clement VII, and was Leo’s right hand man in the papal court. The reason for Raphael painting this picture is rife with conjecture and I will choose the most popular theory which is that it was a wedding present. Theory has it that Leo X commissioned the painting so that his effigy would be present at the banquet celebrating the wedding in Florence of Lorenzo de’ Medici and Madeleine de la Tour d’Auvergne an event which he could not personally attend. According to Lorenzo’s mother Alfonsina her son placed the portrait above the middle of the banquet table next to where the bride sat thus allowing her papal uncle and cardinal cousins to be symbolically present at the occasion. Raphael has depicted Pope Leo X with a degree of realism, rather than idealism, showing him as being rather overweight and with a dour expression. This look of solemnity may be due to the troubled times of his papacy with Martin Luther’s challenge to its authority and his condemnation of Leo’s method of selling indulgences to fund work on the reconstruction work on St Peter’s Basilica. Leo, who was noted for his near-sightedness can be seen clutching a magnifying glass in his left hand which he may have been using to read the book on which his right hand rests. This book has been identified as his own copy of the Hamilton Bible, which his father Lorenzo the Magnificent had given him. All in all a magnificent painting, which has collected a myriad of different interpretations and elicited many theories regarding the symbolism of it as a whole and its many parts, should just be enjoyed and admired as a great work of art. The name of many painters derives from their place of birth. Today’s featured artist is no exception. Antonio Allegri was born around 1490 in the Italian town of Correggio, a small town a hundred miles south-east of Milan. Little is known about Correggio’s early life or his artistic training except that his father was a merchant and he may have initially trained under his uncle the painter, Lorenzo Allegri. When he was seventeen an outbreak of the plague forced him and his family to leave Correggio and move to Mantua. In 1514 he went to Parma and in 1522 he was contracted to paint the fresco of the Assumption of Our Lady on the central cupola of the cathedral. It took him eight years to complete this major work. However the fresco of the Virgin Mary ascending to heaven through a sea of limbs was not well received by the officials of the cathedral with one priest stating that the fresco reminded him of a “stew of frogs’ legs” and it also met with bemusement from the public. However, later, after Correggio’s death, this domed fresco was to be considered highly influential on the development of Baroque dome painting. Whether it was due to the criticism at the time of this fresco or the death of his young wife but he became very depressed and returned to his birthplace were, at the young age of thirty six, he died. 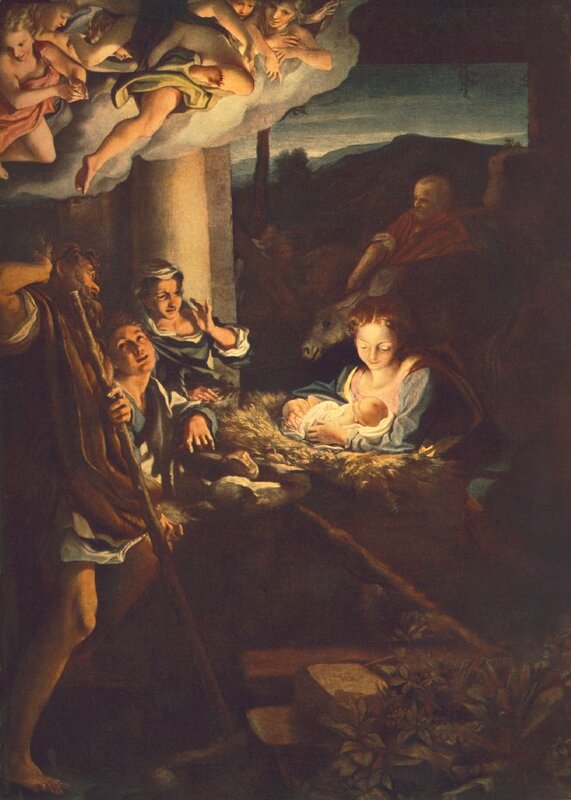 As today is Christmas Day I thought my offering should be connected to the feast of Christmas and so have chosen The Nativity by Correggio. It can be found in the Gemäldegalerie Alte Meister in Dresden. The work of art was commissioned by Alberto Pratoneri for his family chapel in the church of St. Prosper of Reggio Emilia. Correggio finished the work in 1530. In 1640 it was moved to Modena and a century later to Dresden. This painting was described as one of the first monumental nocturnal scene in European painting. Correggio used a style and interpretation similar to that of some of Titian’s works. The scene is fully à la chandelle with the light appearing to both bathe and emanate from the Child Jesus. The Virgin Mary looks lovingly down at the Child as she cradles Him. Looking on are the shepherds and St Joseph whilst up above in the clouds are the angels.